The men's marathon event was a special race invented as part of the Athletics at the 1896 Summer Olympics programme. Michel Bréal originated the idea of a race from the city of Marathon to Athens, taking inspiration from the legend of Pheidippides. 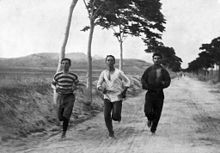 The first such marathon race was a Greek national competition that served as a qualifier for the Olympic marathon, won by Charilaos Vasilakos. The length of the marathon in 1896 was approximately 40 km (25 mi). Twenty-five athletes traveled to Marathon for the race from there to Athens, though only seventeen actually began the race. Just as in the 1500 metre race, Albin Lermusiaux took the lead early. Edwin Flack and Arthur Blake maintained second and third place until Blake dropped out at 23 kilometres. At 32 kilometres, Lermusiaux dropped out as well, leaving Flack in the lead. However, Spyridon Louis was making full use of his endurance to gain slowly on Flack. Exhausted from trying to maintain his pace, Flack dropped out of the race with three kilometres left. Louis was left alone at the front, finishing the 40 kilometre race in one minutes and ten seconds under three hours. Vasilakos finished second, followed 30 seconds later by Spyridon Belokas, who held off Gyula Kellner, with Kellner subsequently lodging a protest, claiming Belokas had covered part of the course by carriage after having supposedly dropped out of the race. The protest was upheld, and Belokas was disqualified.